1 Why to join STM Forum? 4 Which super affiliates you can find on STM? 17 Is STM Forum Worth It? 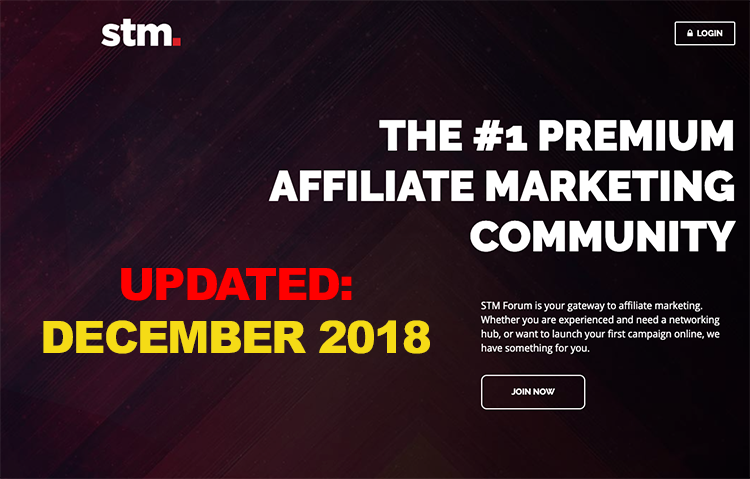 Why to join STM Forum? When I started out in affiliate marketing I had at least million questions in my head. Where to start in affiliate marketing? What is tracker and tracking? What is the best traffic source right now? How does a converting landing page look like? What are the best affiliate networks? How to choose a an affiliate offer? If your answer on any of these was yes, then STM may be right choice for you. All of these questions are already answered on StackThatMoney and if not, you can always ask your own. Good thing about STM Forum is that it’s newbie friendly, so you don’t have to be shy or feel stupid about asking anything. There is a friendly moderators team (btw I’m one of them) who are happy to answer your questions and point you into the right direction. It’s almost like having a team of mentors available to you all the time. STM is a paid forum and it’s price is $99/month. STM forum is still well-known as “stackthatmoney”, even it was rebranded quite a while ago. When someone says “he read it on StackThatMoney”, they for sure meant STM forum. Which super affiliates you can find on STM? 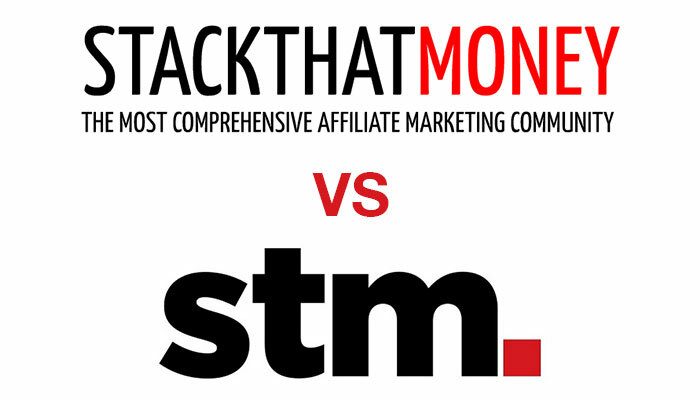 There are many super affiliates and successful affiliates who are more or less active on STM. Forum is divided into many sub-forums and therefore it’s easy to navigate. If the big blue is your thing, then you are on the right place. This sub-forum is dedicated to nothing else, but Facebook. This traffic source may be hard to “crack”, as Facebook’s algorithms are constantly changing, accounts are banned frequently and you need to always stay ahead. There is a “[A-Z GUIDE] CRACK The FB ALGO + EXAMPLES (In-Depth)” tutorial on STM forum that can help you crack the FB code. Also you can find lot of folks and mastermind together, share knowledge on accounts, payments solutions and other things that include FB. Great starter is also the “# The Ultimate Facebook Newbie Tutorial 2018 – Introduction” tutorial by stickupid. This is a quite new section that is getting traction in the latest months when many affiliates started creating their own e-commerce shops. If you are on of them, this section is for you. Everything about running with native sources ie. RevContent, MGID, Taboola, Outbrain and others. Just this month (november 2018) jack_l published a “Cool bot-catching trick for natives (low-tech)”, that discusses the way you can identify and easily block bot traffic from native traffic sources. There is also a good “Native Ads Cheat Sheet” directly from Mr. Green, this one is 2 years old, but it has still very relevant tips. Probably the biggest and strongest sub-forum. Mobile offers and traffic has been a huge trend in the last couple of years for affiliates. It’s not as hot these days (2018) due to lot of regulations from mobile carriers and offer flows changes. However mobile as a type of traffic is still growing and there are still ways to monetize it. There are interesting threads popping up like this one: “Deceptive Attack – Wait Don’t Drop Your Current Domain Yet!”, it’s a trick that can help you to remove your domain flag. Just some time ago a new traffic source by team of Mr. Green was announced: “NEW Traffic Source] Only Pay If You Make Money”. It’s a traffic source that charges you only when you get conversions ie. based on CPA. Definitely interesting and may worth experimenting. Adult affiliate marketing & dating. 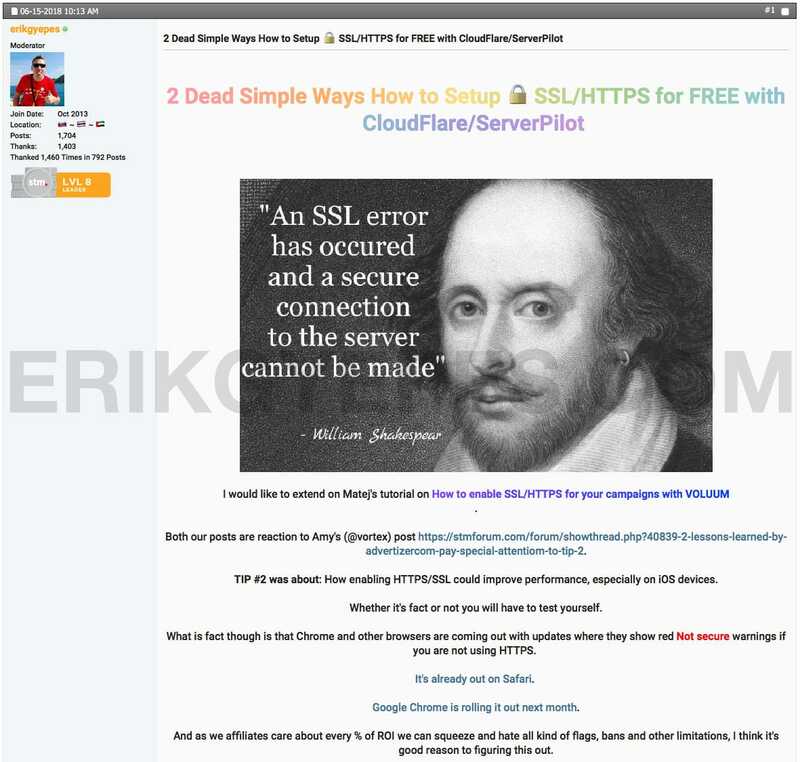 If you run on sources like Exoclick, TrafficJunky, TrafficFactory and others, this one is for you. NSFW part of the internet is old as the internet itself. It’s still well alive (I personally run traffic in these waters as well). The base of the biggest traffic sources remains mostly same over the years, but there are always new things coming – this year for example many of the sources added push traffic. Also native formats were hugely added yearlier this year to the most of the sources. So there is always something going on. As for the threads, interesting discussions pops up like: “If your goal was to make $500/day, how would you do it?” or “Anyone else have a lot of $50-100/day spend campaigns?”. These kind of questions are great discussion starters and you can find lot of helpful insights between the lines. This one goes hand in hand with mobile. Very popular sub-forum where you can learn all about traffic sources like Popads, Zeropark, Propellerads, Adcash and others. Pop traffic was where I started my paid traffic career. It’s still well alive even due to high efforts from web browsers trying to block it. There are always good tips for best pop traffic sources such as this one: “Best Pop Source with Most Mobile Traffic?” or my favorite interesting discussion starters like “Is it possible to make $1000/day on <$2 offers?” or “Question): is it too late to run pop traffic on desktop in 2018?”. This is one of the newest sections that was added just recently. Push notification traffic seems to be a new big trend after POPs. This year literally all of the major traffic sources added some kind of push traffic and TON of push only traffic sources were started. Push Notifications Pioneers, tell us what you learned! I recently started my own follow along running push notification ads with Zeropark and I was able to hit $200+/day profit in just 4 days! Pay per call has been quite hot few years ago, especially with all the (though questionable) tech support offers. There are still some discussions about this vertical to this day, although I would say it’s not as much discussed as it used to be. SEO is not really what STM is all about, as it’s mainly focused on paid traffic methods. 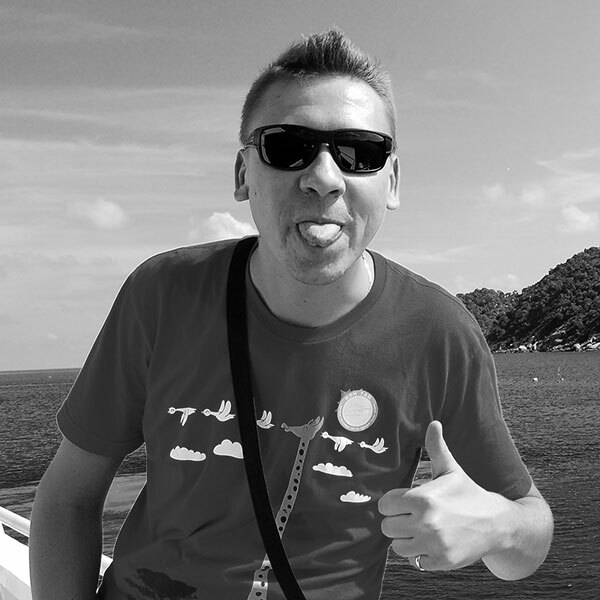 This year with the influx of some serious SEO players (like Greg Morrison) it started to get some real traction. These are the foundations to doing sales and online marketing. Section is not much updated, but when it is it’s mostly well worth. Best converting pick-up lines for dating profiles? Smallest Changes for Biggest Improvement to ROI? Copywriting section also includes 2 sub forums: first is called Everything Angles and the second one is Books & Information Resources which includes many recommendations to great books about copywriting and psychology like this one: The Best Books on Copywriting. One of the biggest challenges for new affiliates is tracking and all the technical difficulties. 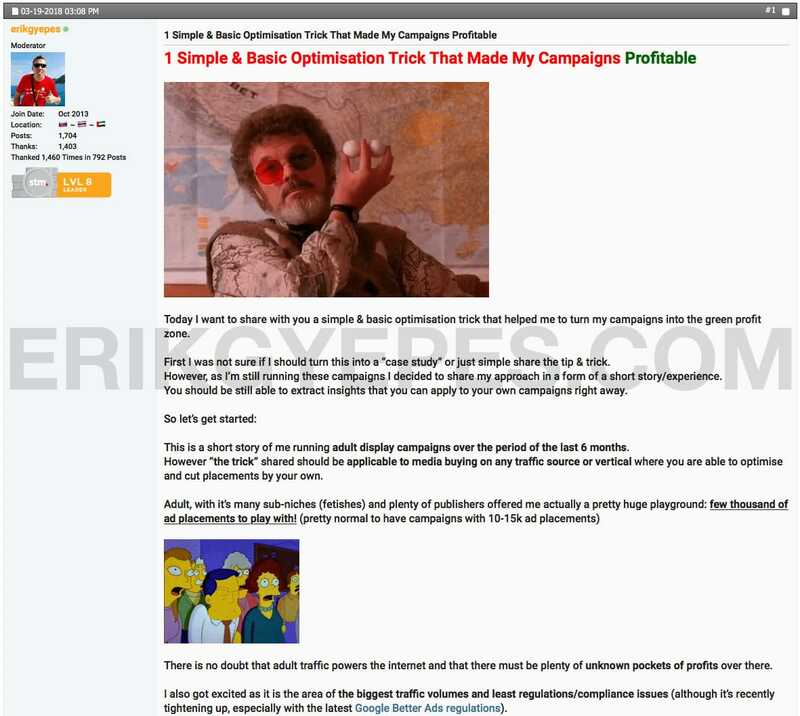 Fortunately there are whole sub-forums for Tracking Campaigns, Programming, Servers & Scripts. What is a tracker and how to set it up? How does dynamic tracking tokens work? What is a postback and how to setup server to server (S2S) tracking? Why to host landing page on a CDN? What is a back button script and how to include it on my landing page? This section is very helpful and you will learn all the basics of tracking here. STM also has sections for Vendors. You can search or offer your services and products. There is a sub section also for Joint Ventures (JVs) or permitted account sales. Networks can also post information about their promotions and their profiles. For us affiliates it’s good resource to find about new services, tools and affiliate networks, so we can be always on top of the game. So you can now find your local peers in your countries and even communicate in your native language! TIP: Search for your country name ie. “Slovakia” and sort it by Category. You will find all your local peers under the “Introduce Yourself – Make Friends” category as most of the members introduce themselves and says where they are from. Note: I used Slovakia just for demonstration, as I’m from there. 🙂 If there are so many members from a small country like SK, there are a lot more from other bigger countries! No, these are not just some catchy headlines, they are actually case studies / success stories of the most successful affiliates on STM. I handpicked them, but there are over 180 threads with over 4700 posts under the Success Stories sub-forum on STM. Let’s say you are ready to launch your first affiliate campaign. You know learned all the basics, but something in the back of your head tells you that you are not 100% confident in your steps. The best thing you can do is to start a follow-along and post your process and steps you took. This way experienced affiliates and moderators can step-in and help you along the way. Follow-alongs are also great threads in general to read through – you can learn the thought process of other affiliates and what steps they took that led them to success or failure. There are many great tutorials following the latest trends in affiliate marketing. I personally also posted some tutorials and content that I exclusively share only on STM, you can see some previews below. Ever worried about getting approved by affiliate networks? Being newbie with no experience may give you worries if you will be approved and able to run the top CPA offers as other super affiliates. Each network behaves differently, some require proof (screenshots) of your previous earning from or contacts to your affiliate managers in other networks you work with. But if you just getting started out? This is where Aff Network Application Tool gets you covered. This tool enables you to apply for multiple affiliate networks just by submitting this ONE application. Networks will automatically see that you are member of STM and it will guarantee you that you will get approved. What if you are looking for a contact from a affiliate network or traffic source that you heard is good? Well, you can checkout Affiliate Contacts Directory, which has been released just recently. Before all the contacts were posted in one long, never ending thread, but now there is a special sub page for members where they can easily search and filter contacts they are looking for. Very easy and helpful to find people by name, email, company name, Skype ID, STM username, offer/traffic type and other columns. Affjobs is a premium affiliate marketing job board. Looking for a job as an affiliate manager or media buyer in one of the top performance marketing companies? Do you have a small job that needs to be done, but are tired of low quality suppliers on Fiverr or Upwork? There are people on Affjobs, that can help with setting up your tracker, cleanin landing page or other tedious tasks you always hated to do yourself. iStack Training is a platform launched by STM similar to let’s say Udemy, but on a whole different level. It offers both opportunities for teachers who want to provide courses and also people who want to take their knowledge to a new level. iStack offers online courses and also live events. Some examples include: eCommerce Mastery, Native Ads Master Class or Ecommerce All-Star Training. Even joining STM and being able to read and learn all these great tips & tricks and strategies may sometimes not be enough. The true power of success in affiliate marketing lies in networking. One thing you can do immediately is to start your own mastermind. Let’s say you are interested in running native campaigns and you are looking for other affiliates on your level. You can post your own mastermind announcements and start working with other affiliates towards same goals. You can share everything together and save money on running traffic, and optimise faster. Mastermind is a great way of learning and it can speedup your way to success. Another great way for progress is networking. I highly recommend you to visit affiliate marketing related conferences such as Affiliate World Conferences or any other around the world or in your area. Meeting affiliates face to face and sharing your experiences is the best investment for yourself. I know many newbie affiliates are trying to search for a group buy. I do not recommend doing so. STM is monitoring all IP addresses and users who are doing STM forum group buy’s are going to be discovered and banned from forum. 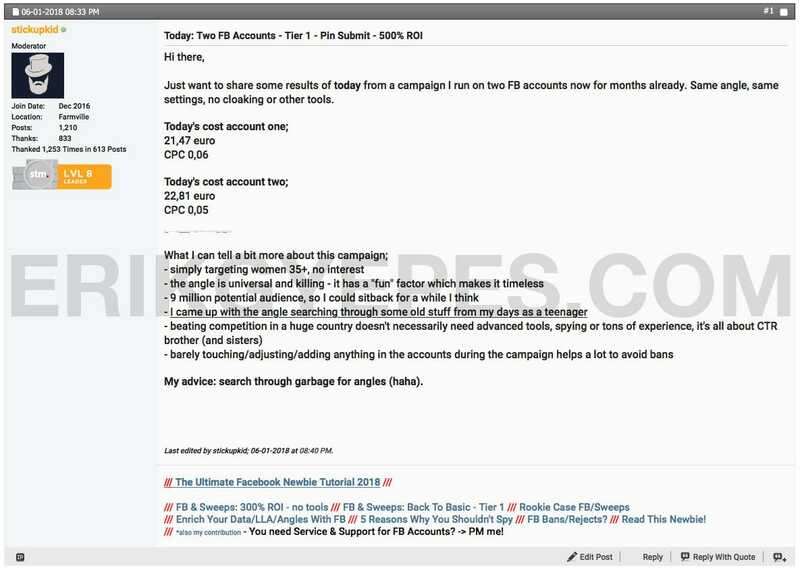 If you don’t have $99/month for a private forum you will probaly don’t have enough budget for doing CPA affiliate marketing using paid methods anyway. If you are serious with affiliate marketing, you should have enough budget to be able to enter these waters. As far as I know, STM Forum doen’t have any coupon codes at the moment. Madsociety is affiliate forum run by super affiliate and musician Malan Darras. It’s also a paid forum and the topics covered there are mostly towards native traffic sources. So if you are into native MadSociety might be interesting for you. 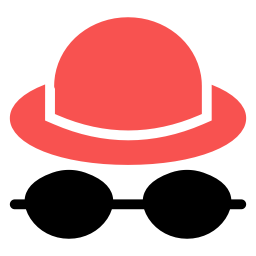 BHW as its name suggest is forum oriented to black hat, it started as a blackhat seo forum, but these days it also covers paid traffic and other segments. The forum as a whole is free, but there is also a private paid section. This forum was formerly started by online enterpreneur Oliver Keynon who later sold it. 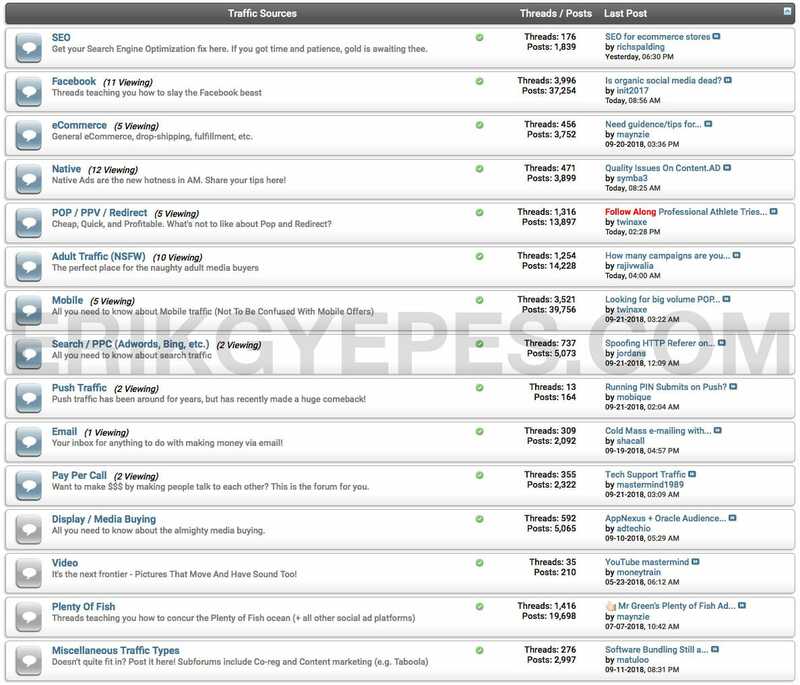 It’s a free forum covering many traffic sources and verticals. It’s newbie oriented and also full of newbies, so you will not find many super affiliates hanging out there. This is a new kid on the block. Forum is started by Luke Peerfly who is also a well-known affiliate bloger. The forum has both free and paid sections. It’s a new forum, so there is not many topics yet, but it’s growing fast. But let’s go back to STM..
Is STM Forum Worth It? If you are starting out in the AM industry, STM is the right place for you. It may be perceived as lower value over time, as you will become expert and you will have feeling that you already know everything. If you are serious into AM then yes, I highly recommend STM Forum as it filters out lot of the buzz and incomplete information that is all around internet or free forums. 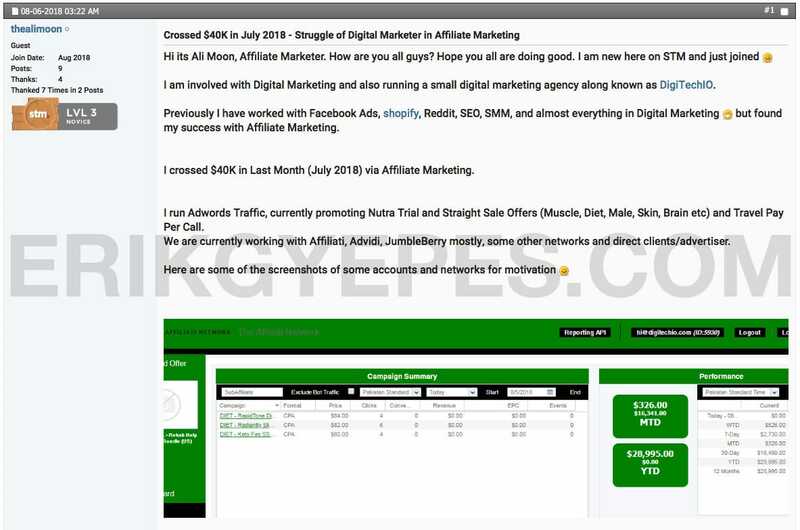 But if you are already making $1000/day or above, I think it may be not interesting for you anymore as you are already on a different level and probably know your way in affiliate marketing. ​Is Affiliate Marketing Dead Again in 2018?